This ground-breaking and highly visual book presents a framework on how to relate to these times of technological uncertainties. The author, a serial entrepreneur, technology investor and futurist, argues that by combining curiosity, a bit of skepticism and understanding of current trends we can gain insight into and take advantage of the opportunities that come from new technologies. This handbook will give you a clear view of technology’s impact beyond the hype and a complete toolbox on how to handle the upcoming revolution from a strategic perspective. You will delve into a step-by-step approach on how to analyze technologies, assess business implications and adapt to a new reality. Digitization is only the warmup, and ignorance is not a viable business strategy! A framework for making the right choices and decisions in an age of rapid technological development. 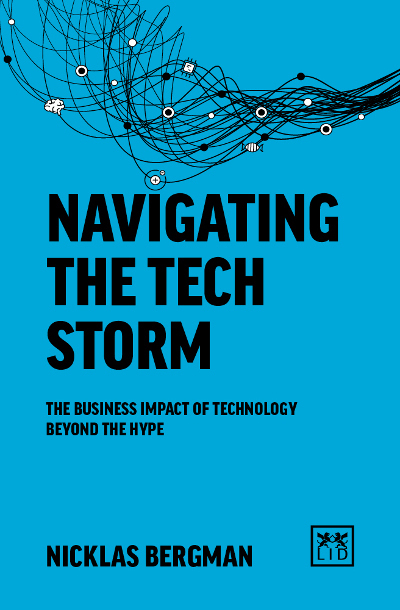 ● As technology evolves rapidly, making the right business decisions become more complicated and riskier – this book offers important guidance. ● The author is an investor who has managed to identify some of the most successful emerging technologies today. ● Books that offer advice about the future are hot currently – this one is engaging, relevant and originally desgined. Nicklas Bergman, founder, funder and futurist, has spent 25 years working as an entrepreneur and technology investor. He is responsible for some epic failures and a couple of home runs. Today he divides his time between investing, speaking, writing and advising on the future of technology, society and business.